Zildjian’ s one-of-a-kind L80 Low Volume cymbals are up to 80% quieter than traditional cymbals without losing the authentic Zildjian feel. The Silentstroke drum heads are the ultimate in low volume drum heads, designed for quiet practice applications where standard drum set volumes are an issue. Now available in a special edition pack thats combines the L80 Low Volume LV468 (14 in. Hi-Hat, 16 in. crash and 18 in. crash ride) cymbal set with a set of Remo’s Silentstroke drumheads (10 in, 12 in.,14 in., 16 in. and 22 in.). 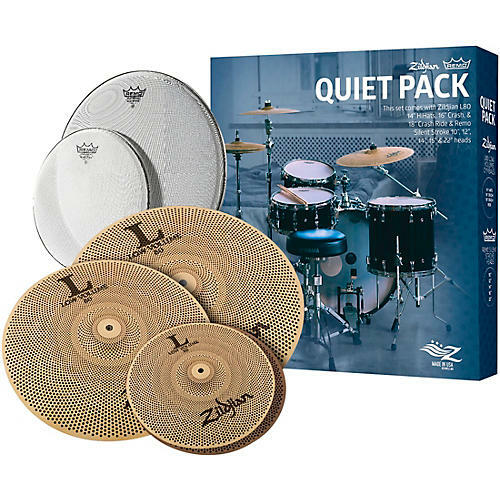 The L80/Silentstroke combination is the quietest cymbal/drum head pack ever made and it is perfect for practice and lesson rooms. Both Zildjian and Remo products are proudly made in the U.S.A.